Detroit’s murder rate, as well as its rate of non-fatal shootings, dropped significantly compared to levels one year ago, Police Chief Warren C. Evans announced last week. Criminal homicides in the first quarter of 2010 were down 25% over the first quarter of 2009. This marks the third consecutive quarter, Mr. Evans's entire tenure, in which criminal homicides have been down over the same quarter the previous year. Meanwhile, the rate of non-fatal shootings also continues to decline. In the first three months of 2009, there were 232 non-fatal shootings while there were 200 in the first quarter of 2010, a reduction of 15%. Mr. Evans gives the lion’s share of the credit to the officers of his Mobile Strike Force, who have been deployed daily into the city’s crime “hot spots” since the new unit was established in October. The Strike Force consists of the Gang Enforcement, Tactical Mobile, Traffic Enforcement, Fugitive Apprehension and Firearms Investigation units. Twice daily, Strike Force staff analyzes crime data and trends and deploy officers into the areas believed to pose the greatest potential for violent crime on that shift. Since Mayor Dave Bing appointed Mr. Evans, homicides have declined every month but one (August) compared to the year prior. 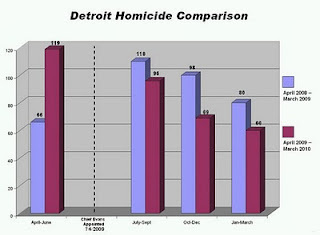 Before Chief Evans took the helm at the Detroit Police Department midway through 2009, criminal homicides in the city already were 50% higher than the first half of 2008. The city was on track to see an astonishing 500-plus murders for the year had that trend continued unabated. In stark contrast, however, criminal homicides in the second six months of 2009 - Mr. Evans half - were down 20% over the same time frame of 2008 and the city finished the year with 364, up only slightly from the 2008 total of 342. In addition to reducing the number of homicides, Mr. Evans said that his Homicide Unit continues to perform exceptionally well, closing 65% of the number of new cases it recorded in the first quarter. Homicide closures at the Detroit Police Department are based on obtaining a warrant and making an arrest. Closed cases include ones solved from the current year or prior years. Helping to boost the Department’s closure rate have been dozens of homicide arrests made by the Special Response Team, which Evans has assigned to serve high-risk murder warrants. Mr. Evans said that the combination of the Strike Force approach and the arrest of such a significantly higher number of murder suspects has changed the dynamic in the city long plagued by spiraling homicide rates. Mr. Evans pointed to the arrest of three individuals over the weekend made by officers of the Mobile Strike Force. Officers stopped to investigate the individuals, who were impeding traffic by standing in the middle of the street. As they approached the suspects, they were all observed to wearing rubber gloves. One of the suspects then reached into a backpack, which officers discovered contained a handgun. When officers searched the other two men, they recovered handguns from them as well. Now you can anonymously text crime tip information to Detroit Police at 847411 (TIP411). All tips must begin with the letters "DPD" followed by the tip information.